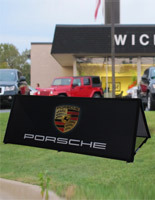 This flag banner is becoming increasingly popular for both indoor and outdoor advertising. 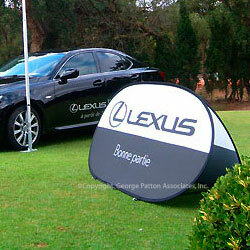 The promotional displays are often seen at sporting events, promoting corporate sponsorship. 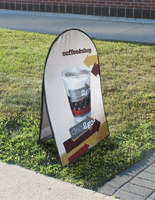 From soccer tournaments to road races, this flag banner, also known as a pop-up feather sign, is a highly visible method for increasing exposure to a company or brand name. A trade show or convention is another great setting these stands are implemented. 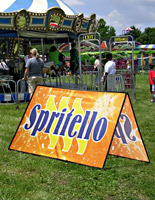 The flag banner is 78" wide by 38" high and has excellent features! Users are encouraged to integrate these stands into their current marketing & promotional campaigns, especially for outdoor events! 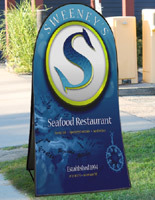 This business A-frame sign, flag banner includes full color digital printing to allow purchasers to communicate the exact message they intend. Unlike other forms of printing, digitally-printed signs offer little to no limitations on colors or gradients. 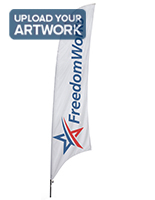 Each flag banner is made from lightweight and wind-permeable mesh polyester. This fabric is weatherproof, too. For further weather-resilience, galvanized steel stakes are included to secure the displays to soft ground, like soil or sand. Sand or water bags can be placed across the hook and loop distancing straps to stabilize the pop up signs on harder surfaces, such as concrete, asphalt or artificial turf. Although the collapsible A-frames are quite large when set up, they fold down to half the size to fit into the included carrying bag for simple portability. 78.5" x 38.0" x 21.6"